Get clean and professional looking edging for lawns, gardens, tree rings, and flower beds in a single afternoon with the EasyFlex No-Dig Landscape Edging Kit. 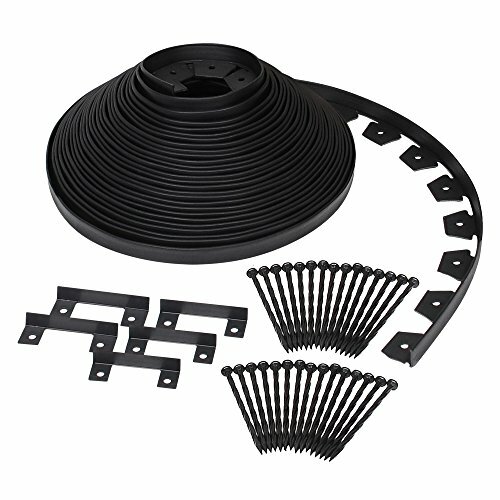 Easy to customize and install, the friendly kit requires no digging and has all the materials you need to create clean and simple paths: a 100-foot black coil made of recycled plastic with a 1.5-inch height, 30 8-inch rust proof nylon spiral spikes, and 5 connectors to securely link multiple piece of edging. Whether you're an experienced landscaper or a DIY weekend warrior, EasyFlex No-Dig Edging makes lawn edging easy to keep your garden in shape. Flexible, yet sturdy plastic can be molded into aggressive curves or hold its shape in a straight line, and spiral spikes keep black landscape borders securely in place. Simply trim the edging to the desired length, create your design, and hammer spikes into the tabs - then sit back and enjoy your beautiful landscape design. If you have any questions about this product by Dimex, contact us by completing and submitting the form below. If you are looking for a specif part number, please include it with your message.